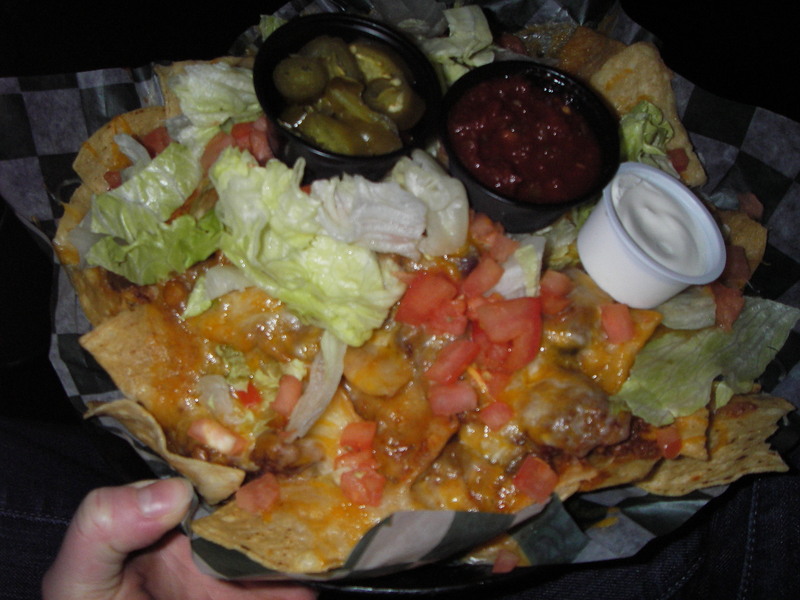 Chunky’s Cinema Pub in Nashua, NH: Lights, Camera, Nachos! Appearance: (7) The movie had started by the time these babies arrived and we had to wait until the photo review. Verdict: pretty OK, but not as vibrant and gooey as they could have been. Our spirits dropped a little at the sight of the dreaded lettuce. Quality of Ingredients: (7) The chili had some of the largest chunks of ground meat we had ever seen! At one point, we came across one that was easily 1/4 the size of a standard hamburger. It was almost too much of a good thing! The chips were standard, pretty tasty. The cheese was good but got cold fast… although we have to admit, we weren’t paying strict attention to the nachos once Matt Damon’s glutes were ten feet tall on the screen in front of us. Price: (9) Well, let’s do some math…$9.29 for the nachos, but if you count the $2 we saved on the movie ticket compared to Boston prices, and the fact that a large pitcher of Sam Seasonal was only $11.50…pretty damn cheap! I have to say, I’m a little disappointed a theater cafe got such a high ranking. My childhood memories of those places tend to be…less than pleasant.